Amnesty International has worked on defending human rights since 1961. Seven million supporters, members, and activists in more than 150 countries and territories are all engaged in campaigns to end serious violations of human rights. * With respect to regular newsletters. Flexible, fast and intuitive: these are the rewarding characteristics of the MailUp platform. Thanks to the database’s filters system, tracking, analysis, and comparison tools, MailUp allows us to filter clusters of contacts and thus build a “warm” relationship with our closest supporters. 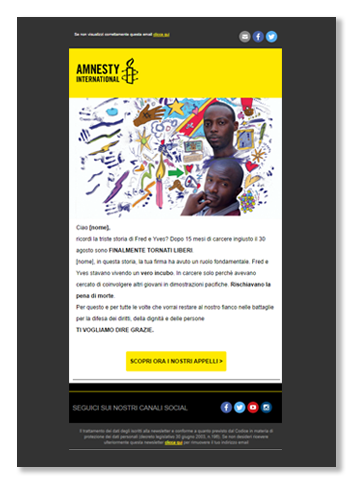 As well as raising its customer base’s awareness through a dedicated email marketing plan, Amnesty International (Italian section) works on signatory users’ loyalty by sending them updates on cases that have been solved thanks to their signatures. Upselling: use the opportunity of new contacts to convince them to sign other appeals and make donations. Amnesty International directs its email marketing activities mainly to the collection of signatures. Their plan calls for three newsletter mailings to collect signatures and an editorial newsletter mailing every month. The campaigns are united by a defined graphic identity, clear calls-to-action, and from a storytelling perspective that always has a valuable story at its core. Additionally, when an issue is resolved positively, Amnesty International updates all supporters who have signed the appeal. This creates a direct line of communication with supporters and helps Amnesty concretely demonstrate the result of a signature, favoring the signing of new appeals and additional donations. A practical example relates to the positive resolution of the story of “Fred and Yves”, two youth in prison for trying to involve other youth in peace demonstrations in their country. After sending the email petition requesting signatures, Amnesty International contacted those who had signed the appeal (12% of the database) to tell them about the two young men’s release. This operation was possible thanks to a MailUp platform filter, obtained by crossing the data of the signatures database with the data of the signatories database contacted via email. The group that was contacted again showed a very positive response to the mailing, with open rates three times higher than those of the first mailing and significant KPI, even compared to unique openings and clicks. These mailings are welcomed by the user base and simultaneously provide Amnesty International with the opportunity to strengthen its image as a concrete and transparent institution. The mailing also created, as a secondary outcome, 1,510 new donations. Treat campaign signatories as part of the association. Create a relationship and inform them of any progress made thanks to their contribution. To communicate with supporters, use the same communication channels you did the first time you began contact with them. In doing so, you can count on your message being recognized. Remember the types of causes each user gave a donation for. You can reuse them to build sending segments, to personalize and make your communication activities more and more consistent.